Please be sure to request a consultation well before your deadline in order to allow sufficient time for a good quality service. Who can request the service? 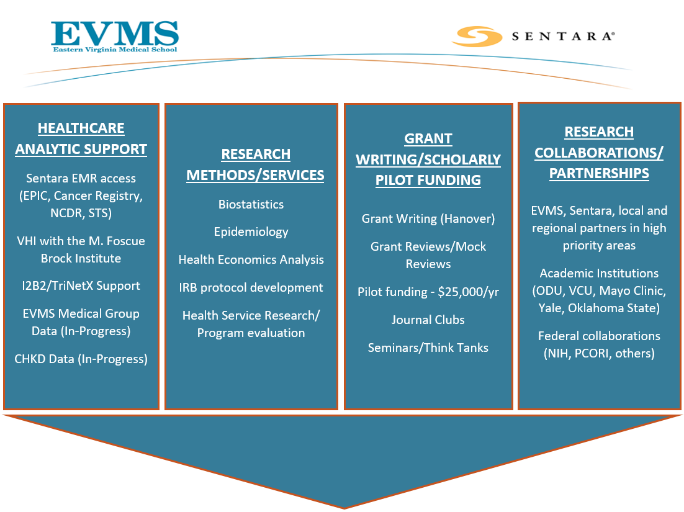 We aim to serve all EVMS faculty, staff, residents and students with research support needs in order to improve the quality and long-term success of scientific research. We also collaborate with surrounding hospitals and partners in the Hampton Roads community. Each project will be performed by faculty or staff with the appropriate expertise. Relevant personnel efforts will be fully discussed and provided to the investigator(s) for each project. Collaboration and consulting support typically begin with an initial meeting to discuss the project and to estimate the amount of time that will be required. Basic questions and analytical problems can be solved during this initial meeting. However, sometimes further work and additional meetings are required. Those who meet the four criteria should be identified as authors. Those who do not meet all four criteria should be acknowledged as contributors. Examples of contributor activities include: acquisition of funding; general supervision of a research group or general administrative support; and writing assistance, technical editing, language editing, and proofreading.